I have a blog I've been sitting on for ever and not doing anything with - I decided to leave a blurb there today with my charts because you may be able to get a better view of the charts from the blog. By the way, I'll be out for much of the day, so good luck to you all! Nice chart ddaytrader, the way I see the market the only option left for the ES is the 5 waves down in the (3C) leg still with that kind of gap it looks more like a C leg up [3C] (green label). Anyaway ES has now reached the trendline resistance so we should have some kind of drop from that level. Well I hope so as I have sold there. I made 10 points on my last ES lot that's enough for me. Wow that trendline sure did stop that ES climb. 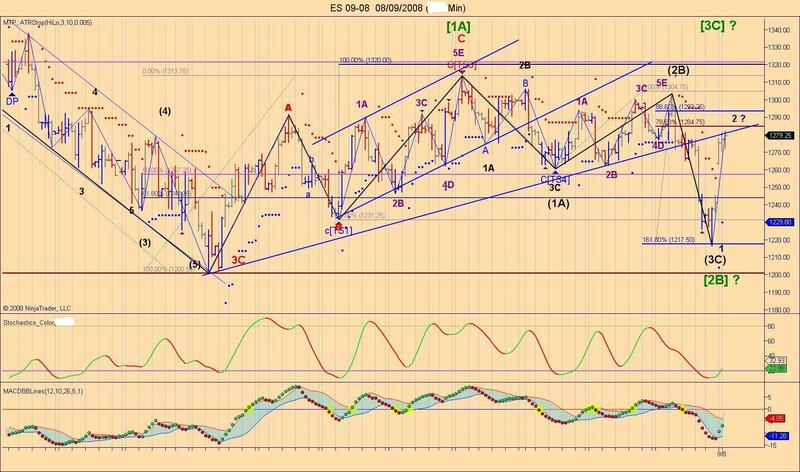 Anyone else think that we might just be start Wave 5 up on the 5 min ES? I'm on the sideline, there is nothing telling me which way to go. Eddo if you have looked at my charts, you have seen that trendline so from my ES charts on tick time frame, we might have completed the first wave 1 up or wave 2 up so we are now at the point that I personally would wait for an ABC down before buying.